A group poses in front of Eckhart Hall in the 1910s. This week, we will launch the celebration of our first century in Aurora with a series of special events on the AU campus; for it was on April 3, 1912 that a special train brought the faculty, staff and student body of tiny Mendota College to their new home in Aurora. The train, emblazoned with two 30-foot long “Aurora College” signs, was met at the Burlington station by a local delegation, who escorted the newcomers to the waiting campus on the far west side of the city. For Aurora, the celebration marked the culmination of an effort begun years earlier when University of Chicago president William Rainey Harper urged local leaders to establish a college of their own. Aurora College, meanwhile, finally had a hometown capable of supporting its educational aspirations. 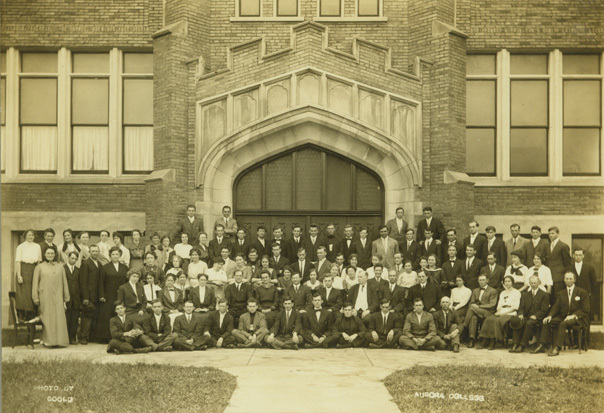 One institutional publication described the city’s many advantages – its proximity to Chicago, its prosperous and growing manufacturing and commercial enterprises, and its many churches – and predicted great things for the young college. Over the next century, the welfare of the college and its hometown became inextricably intertwined. The college educated the city’s sons and daughters and local civic and business leaders supported the institution with their time, talent and treasure. College students often funded the cost of their enrollment by working in area factories and stores and frequently chose to remain in the city after graduation to establish enterprises of their own or to serve as teachers, ministers, nurses and community leaders. The distinctive synergy between college and community was evident time and time again over the course of the 20th century. At the end of World War II, for example, Aurora College responded to the needs of its hometown’s veterans by developing one of the nation’s first evening school programs. Thanks to this innovation, Fox Valley beneficiaries of the G.I. Bill would blend family and work responsibilities with higher education. By all accounts, those were exuberant days as the city and its college enjoyed unprecedented growth. Aurora’s hometown college became a university in the mid-1980s and today offers a wide range of baccalaureate, master’s and doctoral degree programs. Whereas about 60 students, faculty and staff rode the train from Mendota to Aurora a century ago, AU now enrolls 4,400 students and employs 833 faculty and staff at its three locations in Aurora and Woodstock, Ill., and Lake Geneva, Wis. With its $58.4 million annual operating budget and total net assets of $92 million, AU’s annual economic impact on the Chicago area has grown to $325 million. So much has changed. And yet so much remains the same. Aurora University is proud of its singular mission of transforming lives through learning, and we remain dedicated to the core beliefs and aspirations that prompted our predecessors to seek a more prosperous home for their college. We still offer an excellent, personalized educational experience at an affordable price and seek especially those who value hard work and its benefits. And, as we celebrate the 100th anniversary of our move, we look to an even brighter future as Aurora’s University. 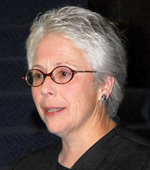 Dr. Rebecca L. Sherrick is the president of Aurora University. For more information, please visit the centennial website, which includes a timeline of the university’s history and interviews with alumni from around the country.